I thought I'd enter my first blog challenge. I've chosen the Sarah Kay Weekly challenge as they are my favourite stamps at the mo. The challenge is to produce a Sarah Kay card or project themed around the colour blue including at least one Sarah Kay image. I stamped the Sarah Kay image with black Versafine, then watercoloured it. 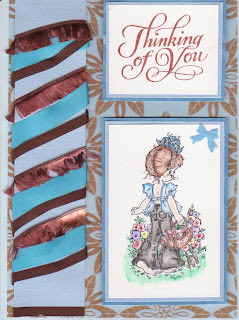 Added blue and brown ribbons and fibres to a piece of blue card. The sentiment was stamped with brown Versa colour. Everything was matted and layered onto backing paper from stash. It's probably a bit soon for me to be entering blog challenges as it's so early in my card making days. Also I've only just started my blog so it needs a lot of work and learning yet, but I just thought I've got to start somewhere, sometime so why not take the plunge and have a go. Lovely card and I really like how you've set up your blog. Lovely card, I love Sarah Kay, I am sure they used to be around when I was younger, I remember having some stickers.